A daytime Vitamin C serum enriched with 15% Vitamin C and Jasmonate Derivatives to improve the loss of elasticity and boost a more radiant complexion. 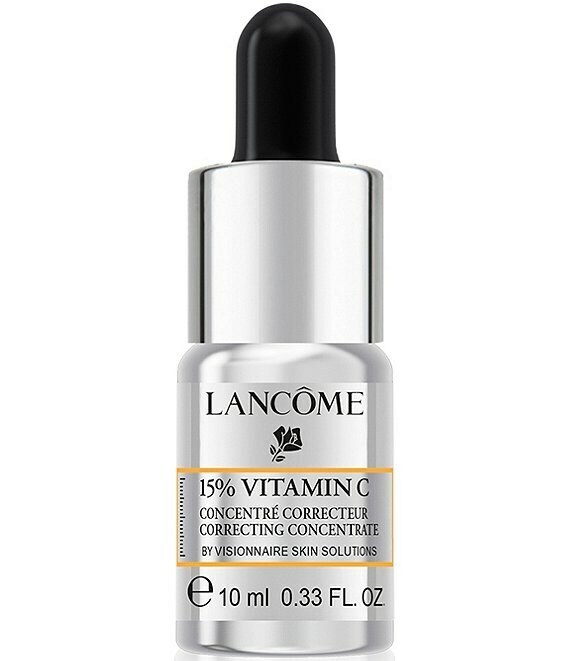 For the first time, Lancôme Laboratories developed a 15% pure Vitamin C formula that aims to transform the look of skin. Our new formula helps to improve the appearance of uneven skin tone, loss of firmness, and correct dullness. Skin looks revitalized with a youthful luminosity. The Serum is split into two 10ML viles to preserve the freshness of the product, but only one dropper will be provided for both serums. When you finish the first vile of Vitamin C serum, you may dispose of the bottle but keep the dropper to use for the second vile. Place 4 to 5 drops in the palm of your hand, then use fingertips to apply to a clean, dry face. Avoid the eye area. Let sit for a few moments, then apply your usual cream. This is a strong product. Avoid contact with eyes and lips. In case of contact, rinse immediately and thoroughly. In case of persistent irritation, stop using the product and contact a doctor. Apply a broad-spectrum sunscreen while using this product and for 1 week after. Use with Visionnaire Nuit, A gel-to-oil beauty sleep perfecting night moisturizer that visibly nourishes skin, refines texture and pores, for skin that is smoother, softer, and bouncy.